Paul Oppenkamp chose to remain in Romania in 2012, after six years of repeated visits and accepted the challenge of building a concept that highlights modern cooking techniques emphasizing on creativity in cooking. With an enormous amount of knowledge in the field, Paul feels privileged of the opportunities offered due to his choice to travel around the world “it is a great opportunity to experience traditional cuisine of most countries, to understand each ingredient and their influence on locals life finally understanding their culture”. The same thing happened with traditional Romanian dishes. Every time he came to Romania, his mother in law was preparing delicious Romanian dishes and he used to visit the grandmother garden in the village, the source of the ingredients. Paul, originally from Hoorn, graduated the School of Culinary Arts in Heeruwgowaard, The Netherlands. His Gastronomic journey started on a young age and worked in restaurants since he was 14 years old. The spirit of good coordinator, the intensity and passion dedicated to gastronomy, have guided his career and at age 24 he became Executive Chef, leading the entire culinary team. Paul has chosen opportunities that helped him put into practice his inventiveness. In the last 5 years before opening the restaurant his “workshop” was the kitchen of the ultra-luxury yacht “The World” – the largest private mega yacht. 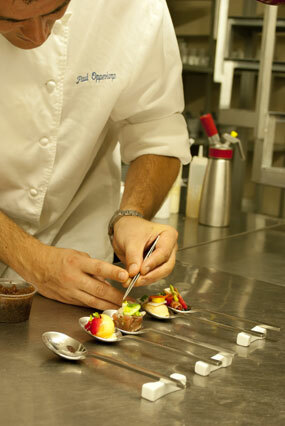 Here Chef Paul exceeded the expectations of the people with intense gastronomic experiences. the Artist is now the place where Chef Paul transformed through the magic of texture, flavor and color of each preparation in stunning delicious sculptures. The restaurant was relocated in January 2017 and is now in a wonderful villa on Calea Victorei 147, near P-ta Victoriei. The Dutch Chef has a modern cooking approach that combines classical techniques with modern cuisine and Romanian cuisine influences, resulting in surprising combinations of textures and flavors that revolutionize the dining experience. Those who walk into the restaurant do the first steps on a memorable journey. At “the Artist” culinary experience is the transformation into an experience of emotions. Each dish is designed to reach all sensory chords. Here you will experience the amazing taste of something truly new, innovative and delicious. To offer new emotions and unique experiences, every season Chef Paul creates a new collection of delicious masterpieces, to the delight of loyal guests. Each menu is left to the imagination and artistry of blending the highest quality ingredients prepared with more creative and surprising presentation using cooking methods that optimize flavor. With an elegant ambiance in an establishment where modern design blends in with the historical elements of the property well preserved to enrich its personality, Restaurant “the Artist” creates a perfect setting for a unique experience for romance, friends or business. Here your imagination will be challenged and known gastronomic limits will be demolished. Are you ready for a unique experience?